How do you know how many steps you're walked and how many calories you've burned? I do not have them . Nice to see some FF comparison images in the review! Seems to be the kind of lens I hoped for. Thank you for the link! Last edited by acoufap; 02-12-2019 at 11:15 AM. The other noteworthy sign is ‘Last Chance Gas’ just after you cross the Wabash River at Evansville into eastern Illinois. There’s nothing between the Wabash River on the east and the Mississippi River on the west at St. Louis. Yes, population in the Midwest can be delightfully sparse. We lived in Kansas once in a county half the area of the state of Rhode Island but had a total population of under 10K. Some of us like that. When we lived in western Massachusetts, the relatively sparsely populated part of the state, I felt the continual crush of people. Even a local fair would attract a crush of people that reminded me of what the Indy 500 attracts. Last edited by reh321; 02-12-2019 at 11:51 AM. HD PENTAX DA*11-18 trial shots | nu llpo | FlickrOn this one, the edges looks very blured, I hope this is just because the focus is at infiny instead of hyperfocal. It's f/5.6 at 11mm. Looks like a little field curvature and distortion. To be expected with a lens like this. Focusing at hyperfocal with lenses that have field curvature is asking for weak edges. Have to focus further into the scene. Or focus at the edges (manual focus with punch zoom) then check the center is still sharp, if not adjust to get even sharpness across the frame. I grew up in a small town in South Jersey with a cornfield in my backyard used by the local Dairy Farmer so I felt right at home passing through Indiana. There is no field curvature problem with 12-24 and you can have the entire scene in focus without any trick. Hyperfocal works as expected with 12-24, so I expect a lens twice as expensive to have field curvature corrected and to focus property in every situation. If you already have the DA 12-24, and it works better than the DA* 11-18, I guess you'll save a lot of money not purchasing the DA* 11-18. Thanks for posting the MTF curves, Caliscouser. You can see both the 11-18 and 12-24 actually have very little field curvature. And that the 11-18 is a lot better, it's what being twice the size and cost gets you. Comparing 11mm f4 to 12mm f4, which is the most direct possible from these graphs, the Sagitall contrast is 90 vs 80 at the edge, and the same microcontrast (probably represents best what you mean by 'resolution' - fine detail) is about 45 versus about 25. 15-20 might be considered the lowest acceptable score. That the SvM track so closely means astigmatism is really minimized, so it should mean superior bokeh and is also an exciting prospect as an Astro lens … helped that it is also f2.8, not f4. Now, the 12-24 … I own it. And it's such a good lens I've used it on the K-1. But the DA* is clearly better. Last edited by clackers; 02-17-2019 at 03:37 AM. No sense to compare 11 mm with 12 mm and 18 mm with 24 mm focal length. It's some kind of trick. 1 mm is serious difference for ultra-wide angle lenses. I hope we will see direct comparison in review here (at PF) at 12-18 mm range.It will be honest. I think the difference will be very low, especially, at centre. Here's a report on the DA*11-18 with several samples from Yatomi Camera. As usual with this site, when you see a small thumbnail to the right, you can click it for a 100% image. ?????? 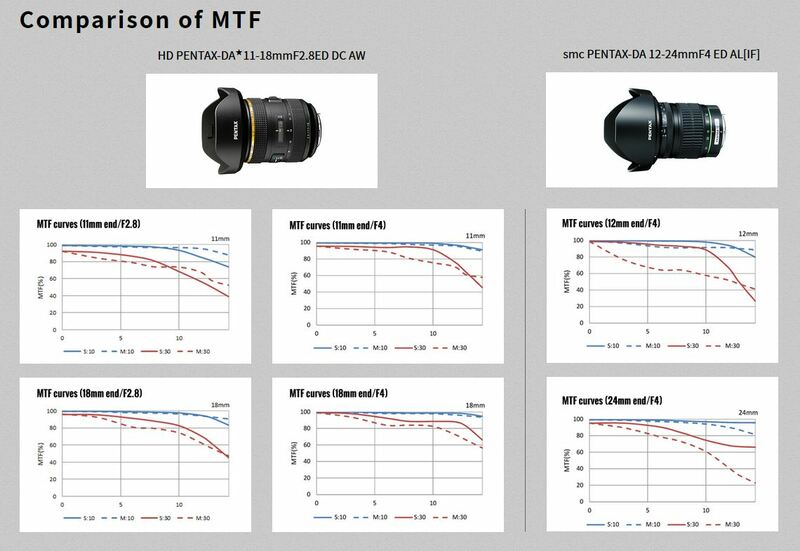 HD PENTAX-DA?11-18mmF2.8ED DC AW ???????? ? ?? ??????? - ???? Last edited by JPT; 02-17-2019 at 07:59 AM.